The ring modulator in the 2600/TTSH can be DC coupled, so you can use it as a VCA for control voltages with the switch in the DC position. 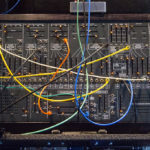 You probably won’t be using the ring modulator in every patch, and that means you often have a spare VCA for other interesting and useful duties. After having immersed myself in manuals, online threads, vintage synth books, patchbooks, and music collections, I thought a good (and long overdue) wrap-up to the series here would be a random brain dump of what I learned.